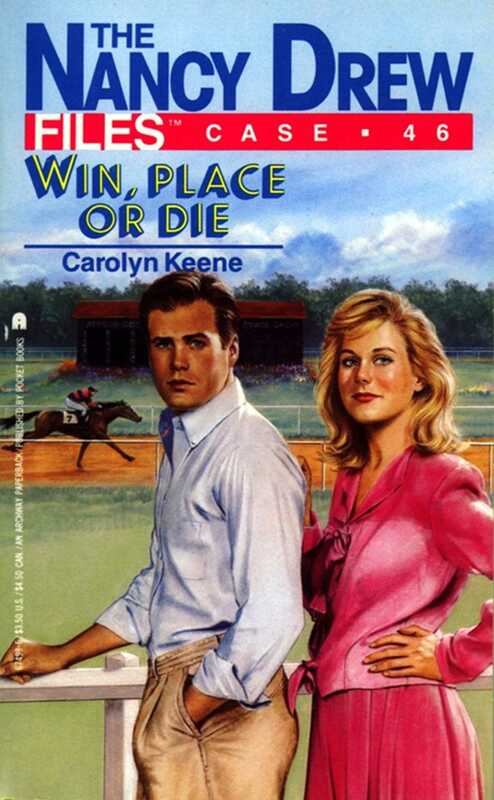 Nancy goes to the Kentucky Derby -- where death is the dark horse. When Carson Drew invests in a Derby entry called Pied Piper, Nancy and Bess fly to the big event. The favorite is Toot Sweet, but during a workout an accident nearly takes the horse's jockey out of the running. Later, while racing, the jockey takes a nasty spill, and Nancy is sure the real cause is foul play. The teen sleuth sets out to track a treacherous opponent at the world-famous Run for the Roses -- only to find she's a sure thing to hit the finish line dead last. Bored, bored, bored!" Nancy Drew said, picking up a news magazine. She thumbed through it, tossed it aside, and flopped down on the living room sofa. "I'm bored!" The girl detective stared at the ceiling, listening to the rain that had plagued River Heights all week. She'd had to cancel her tennis lesson that afternoon, and unless the weather broke soon, her match that weekend would have to be postponed, too. Tapping her foot on the sofa's armrest, she checked her watch. Bess Marvin had promised to stop by around five o'clock, after her hair appointment, but it was already almost six. Hearing the back door open, Nancy jumped to her feet. "Dad? Is that you?" "Yes, Nan," Carson Drew, River Heights's famous criminal lawyer, called out. Nancy hurried into the kitchen, where her father was just laying his briefcase and the evening paper on the table. "Am I glad you're home. I've had the dullest day in history! Hannah's visiting friends, George is on that trip with her parents, and Bess is almost an hour late!" Her father laughed and gave her a quick hug. "And you don't have a mystery to occupy your time." He paused. "I think I may have a cure. " Nancy's detective instincts went on red alert. During the course of his work, her father stumbled on many mysteries. Maybe he'd found one now. Carson unfolded the newspaper to the sports section. Above a black-and-white photo of horses thundering down a racetrack, the headline read: "Top Three-Year-Olds Ready to Run for the Roses." Beneath that, in smaller letters, it stated: "Derby Crowd Expected to Be Largest Ever." Nancy glanced at her father quizzically. "The Kentucky Derby?" "The greatest two minutes in sports," her father added. "Now that we're owners of Pied Piper -- " he started to say, pointing to the horse in the center of the field. Nancy stared at her father, amazed. "What do you mean we own a racehorse?" she interrupted. Carson Drew's handsome face broke into a smile. "I just bought into a three-year-old Thoroughbred with some business associates of mine. We now own a quarter share of Pied Piper." "You're kidding!" Nancy's blue eyes sparkled with excitement. "Dad, that's great! Does Pied Piper have a chance of winning the Derby?" "Well, I certainly hope so. Thea Rodriguez, the colt's trainer, seems to have confidence in him." "Pied Piper's trainer is a woman?" Nancy asked. Carson nodded. "One of the best in the business, I understand." "Wow!" Nancy quickly scanned the article. "When exactly is the Derby?" "A week from tomorrow -- Saturday." Carson frowned. "I'd like to go, but a case I've been working on is scheduled for trial next week. I'm afraid I can't make it." Carson grimaced. "It certainly is. Someone will have to go and watch out for my interests." "One of the other owners?" Nancy guessed. "Unfortunately, all of the owners have commitments they can't break," he said regretfully. "Okay, I'll bite. Who?" Nancy's blue eyes danced at the teasing smile that spread across her father's lips. "Not me?" "If you're not too busy. " "Busy! Dad, this is great!" She flung her arms around his neck as the front bell pealed loudly. "That's Bess!" Nancy cried. "Could I ask her to go along with me?" Carson laughed. "Ask away. In fact, I'd be happy to know you had a friend with you." Nancy raced to the door. Bess, her blond hair trimmed and freshly styled, stood on the porch. Before Nancy could tell her the good news, Bess wailed, "My hair! Look at my hair! No, don't look at it!" She tried to cover up the front of it. Nancy's brows lifted. "What's wrong? Your hair looks great!" "The front!" Bess moaned. "She cut bangs and she cut them too short -- they're all jagged and weird. The whole haircut makes me look like a Fashion Don't!" "Oh, come on. It can't be that bad." Nancy pulled Bess's hands from her forehead. "You look terrific. The bangs are fine. No problem." "You really think so?" Bess asked doubtfully. "Would I lie to you?" Nancy answered. "Come on. Forget about your hair for a minute. I've got tons to tell you. " She led Bess into the den and then quickly filled her in on the Kentucky Derby and Pied Piper. "Your dad owns a Thoroughbred and wants us to go to Louisville?" Bess repeated when Nancy finished. "Oh, I can't wait!" She paced the den floor, muttering under her breath. "I've got to convince Mom and Dad, and I've got to go shopping. But this hair!" She closed her eyes in remembered misery. "I can see you two have a lot to talk about," Nancy's father said dryly, standing in the den doorway. "I wrote Thea's hotel number on the pad by the kitchen phone. I left word you'd get in touch with her tonight. There's a hotel reservation waiting for you, too. One of my partners made it months ago. Since he can't go, it's all yours." "Let's call her," Nancy suggested after her dad left. "Right after I talk to my parents," Bess agreed. Although it took a little convincing, Mr. and Mrs. Marvin agreed to let Bess go with Nancy. Bess whooped with delight when she replaced the receiver. Next Nancy phoned Thea Rodriguez, but the trainer wasn't in her room. Nancy left a message saying she and a friend would be arriving in Louisville sometime Monday afternoon. "I'd better make the flight reservations right now, she added, grabbing the phone book. Thirty minutes later all their plans were set. "I can't believe it!" Bess said before she left the Drews' later that evening. "Well, start believing it." Nancy grinned. "Early Monday morning, we're heading for the Kentucky Derby!" As soon as their flight landed in Louisville, Nancy's pulse began to pound wildly. She and Bess picked up their bright red rental car and drove through Louisville's busy pre-Derby streets to their downtown hotel. Hurriedly they changed into shorts and light cotton blouses. It was only a little after one when they were on their way to Churchill Downs, the famous racetrack of the Kentucky Derby. Bess adjusted the baseball cap she'd stuck on her head to cover her bangs. "Look, Nancy!" she cried excitedly. "We're almost there!" Nancy glanced through the windshield. In the distance the twin spires on top of the grandstand were etched against a powder blue sky. "Just a few more minutes," Nancy agreed. "I can't wait to meet Thea. She said she'd be with Pied Piper at the barn ten." "What did she sound like?" Bess asked. "Nice. Busy though. We barely had a chance to talk. She spends practically every minute with Pied Piper." Nancy pulled to a stop at a red light. "She told me she even sleeps on a cot in the barn most nights, so she can be near him." Nancy parked as near as she could to the wire fence that surrounded the stable area. Horse trailers were everywhere. According to the pamphlet she'd picked up at her hotel, Derby hopefuls weren't the only horses housed in the barns. Other Thoroughbreds slotted for races run earlier in the week were also stabled there. Although it was only about ten miles from Louisville to Churchill Downs, Nancy noticed the carnival atmosphere of the city had disappeared. The mood was subdued by the racetrack stable area. Race people obviously took their sport seriously. "Which one is barn ten?" Bess wondered out loud, glancing around at the row of buildings. Nancy studied the numerous buildings and shrugged. "Let's ask." They passed through a narrow gate. Ahead lay the brown ribbon of track as it swept one and a quarter miles in front of the sheds, barns, grandstand, clubhouse, and bleachers. "Wow," Bess said, awestruck by the scene in front of her. The place was busy with people and horses, alive with noise and the sharp scent of the Thoroughbreds. "Maybe we should go to the secretary's office," Nancy said, remembering Thea had said that was where everyone checked in. "Wait a minute," said Bess. "Here comes somebody. Do you think he's a jockey?" The short, red-haired man heading their way could easily be a jockey, Nancy decided. She knew all Derby horses carried one hundred twenty-six pounds during the race. The jockey had to weigh even less because the saddle accounted for some of the weight. The guy coming toward them looked about a hundred and ten and was several inches shorter than Nancy. Nancy smiled in greeting, but just before he reached them, the redhead turned toward the fence near the track, digging into the pocket of his jacket. He pulled out a piece of paper and scowled down at it. "He doesn't look like he's in a good mood, does he?" Bess murmured. Tucking a strand of reddish blond hair behind her ear, Nancy wrinkled her nose. "Not exactly. Let's find someone else to ask." They had taken only two steps when a heavyset older man with a flattened nose marched straight toward them and almost collided with Bess. Bess stopped short, and the man brushed past her, bumping against her shoulder. He strode straight for the red-haired jockey without a word of apology. "Well, excuse me," Bess muttered under her breath. "He doesn't look like he's in a good mood, either," Nancy remarked. The jockey started yelling at the heavyset man as soon as he joined him. "I said I'd get you your money, didn't I? Now leave me alone!" the jockey shouted. The older man snapped back an answer in a low voice, too soft for Nancy to hear. Intrigued, Nancy eased back a few steps, pulling Bess with her. "What are you doing?" Bess whispered in her ear. The jockey was glaring at the older man, his face ghostly white. Nancy leaned close to Bess, pretending to talk to her. In reality her attention was on the two men. "I'm not stuffing," the jockey asserted, his voice lower now but shaking with emotion. "You'll get your money the right way!" The man with the flattened nose suddenly glanced over his shoulder. His dark scowl centered on Nancy. Nancy's heart lurched. Heaving a deep sigh, she complained dramatically, "Oh, I don't know, Bess. It's all a little disappointing, don't you think?" Bess gazed at her in blank disbelief. "Well, sure," she said slowly. "I mean, I guess so." She leaned closer and whispered, "Are you serious?" "Of course not," Nancy whispered back through a plastered-on smile. Something strange was going on between the jockey and the heavy set man, and she was going to find out what. The heavyset man, apparently reassured, turned back to the jockey. This time she caught the words he whispered to his friend. They sent a chill down her spine. "By race day, McHugh," he growled in a raspy, threatening voice. "Or you can kiss more than the Derby goodbye!"